Black shank is among the most destructive and widespread of all tobacco diseases in North Carolina. Black shank first appeared in the United States in 1915 and was first reported in North Carolina in Forsyth County in 1931. Currently, black shank can be found in every North Carolina county that grows flue-cured tobacco. Improved breeding efforts and chemical control measures have been added more management tools for this disease, and reducing its economical impact requires an integrated approach in fields with high disease pressure. Black shank caused by the soilborne oomycete (fungal-like organism) Phytophthora nicotianae (Syn. 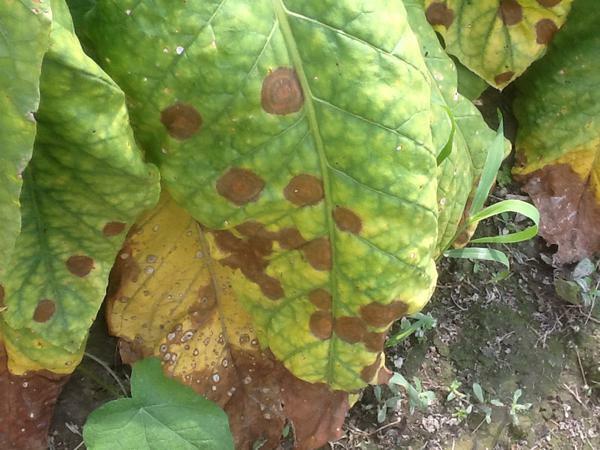 Phytophthora parasitica) is one of the most destructive diseases on tobacco. Like other water molds, black shank is favored by high humidity or wet conditions and warm temperatures. P. nicotianae is polycyclic, and reproduces asexually and sexually. Asexual reproductive structures, sporangia, chlamydospores, or zoospores can all germinate to form hyphae on and within affected tissues. Chlamydospores, thick-walled resting structures, are formed when soil conditions are not conducive for infection, surviving from 4 to 6 years in soil. Sporangia may germinate directly by production of hyphae on host tissue or release zoospores, motile asexual spores. These swimming spores are chemically attracted to tobacco by root exudates produced primarily at growing points and wounds. During favorable conditions for the fungus, a new generation of motile spores is produced every 72 hours. While wounds are not required for host infection, they do favor more rapid disease build-up. This pathogen is capable of sexual reproduction. During the sexual cycle, two mating types (A1 and A2) are required for sexual reproduction to form oospores. Usually only one mating type is found in the same field, and sexual spores are not thought to be the primary survival structure or initiate infections. Black shank can affect any part of the tobacco plant at any growth stage. Root and crown rot are the most common symptoms associated with P. nicotianae, but leaf spots may also be caused by this pathogen splashing from the soil onto leaf tissue. Leaf spots appear and form circular, yellowish-to-brown lesions up to 3 inches in diameter, with concentric rings, and are usually limited to lower leaves that are typically removed later in the growing season (Figure 1). Root and crown infections are characterized by rapid yellowing, wilting of leaves, and eventually plant death (Figure 2 and Figure 3). At the ground level, a dark brown to black lesion often appears on the stalk. When cut open, the lower stem and crown often show blackened pith with distinct disks and white hyphae (Figure 4). Stalk disking and blackening is only of diagnostic value in conjunction with other observations, as disking may be caused by other factors (other fungal infections, lightning strikes, etc.). In severe cases and periods of prolonged drought, wilting symptoms and pith necrosis are followed by death of the entire plant. Figure 1. Leaf spots caused by P. nicotianae. Figure 2. Field affected by P. nicotianae. Figure 3. Plant affected by black shank. Figure 4. Blackening and disking of tobacco pith. This pathogen can produce yellowing and wilting of leaves, and browning of the pith. The causal organism of Fusarium wilt is a weak pathogen, and often requires other damages to the roots, such as poor environmental conditions or nematode infestations. This pathogen also causes yellowing and wilting of plants; however, Granville wilt often causes a one-sided wilt initially. When stems are cut open, brown, water-soaked lesions are usually visible within the pith (Figure 7). Bacterial streaming can also be observed when a section of diseased stem is placed into a cup of room-temperature water. Figure 5. 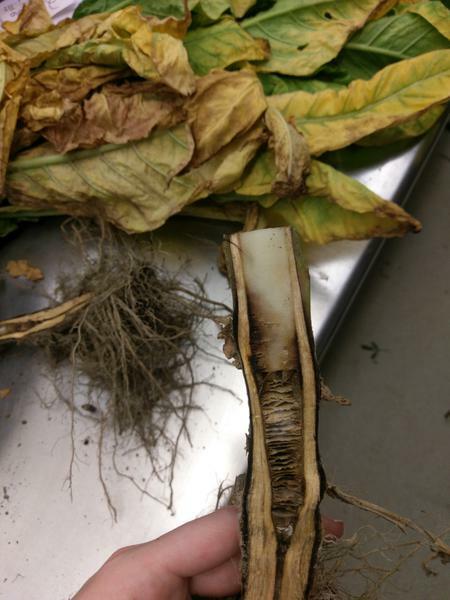 Fusarium wilt of tobacco. Figure 6. Granville wilt of tobacco. Figure 7. Brown, water-soaked lesion caused by Ralstonia solanacearum. Phytophthora nicotianae causes a polycyclic disease, whereby inoculum is generated exponentially during the growing season. After the winter, the survival spores (chlamydospores) can infect the tobacco plant directly through the roots tips. Where sexual reproduction occurs, plants may become infected by oospores through the roots. After the penetration wilting and chlorosis occur, causing the death of the plant. This pathogen may also cause a leaf spot from infested soil that splashes onto the leaves during rain events. Images of this pathogen and its life cycle can be found at the Tobacco Diseases website. This disease is spread to new fields when infested soil is moved from one place to another, often on infested equipment or plants. Contaminated irrigation or runoff water may also aid in its movement within a field or from one field to another. Selecting resistant varieties (Table 1) is the most economical management of this pathogen for tobacco growers. Since complete resistance to this disease is not available with recent race shifts, use of resistant varieties should be considered in combination with other management practices. Table 1. 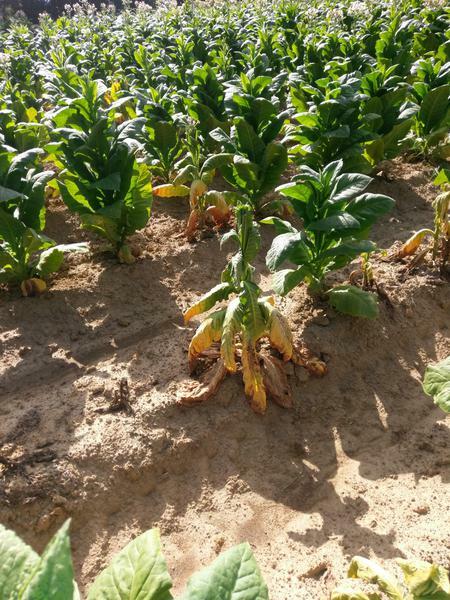 Select tobacco varieties with high levels of resistance to black shank disease. b % Survival ratings are the percent survival based on the observed percent of healthy plants across 3 years data and several growing regions heavily infested with disease. Higher ratings equate to a higher level of resistance. c Disease Index ratings are the average disease index across 3 years of data and several growing regions heavily infested with disease. The lower the disease index rating, the higher the level of resistance in a given variety. Field sanitation is an important step in managing this disease and reducing its spread. Destroying stalks and roots quickly after harvest will help reduce inoculum. Improving drainage in areas where is water pools can reduce the environmental suitability of the soil. Rotation with non-host crops may help reduce inoculum in the soil. Because Phytophthora nicotianae is host-specific, other field crops can be used in rotation. Longer rotations will reduce inoculum more than shorter rotations. Fungicides may help reduce disease incidence in fields with disease. Three different fungicides are now labeled for use in tobacco (Table 2). 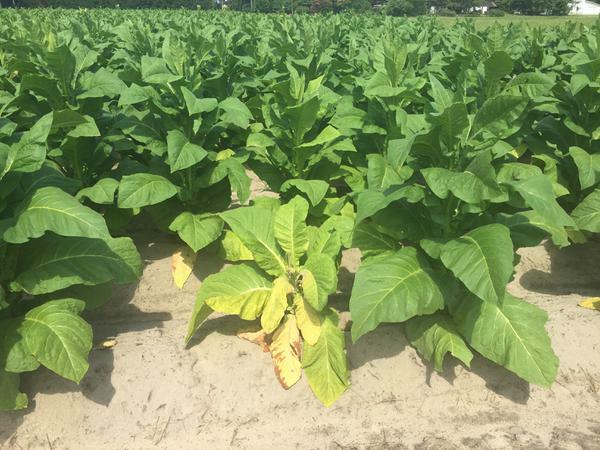 Early applications (transplant water applications) are the most effective in reducing disease in tobacco fields, and repeated applications may be necessary in fields with high disease pressure. Due to phytotoxicity observed in field conditions, Presidio should not be used in transplant water applications. Orondis Gold, released in 2015, was originally released in a multi-pack that was not premixed. Although by 2018 this should be in a premix form, any chemical remaining in a multi-pack format should be mixed with the both fungicide containers (oxathiapiprolin + mefenoxam) in the pack to reduce fungicide resistance development in pathogen populations. In fields with high disease pressure, fungicides in combination with the selection of a resistant variety and good cultural practices may be required to manage this disease. Table 2. Fungicides to manage black shank on field. The NC State Extension Plant Pathology Portal provides information on crop disease management. The North Carolina Agricultural Chemicals Manual provides pesticide information for common diseases of North Carolina. The manual recommendations do not replace those described on the pesticide label, and the label must be followed. 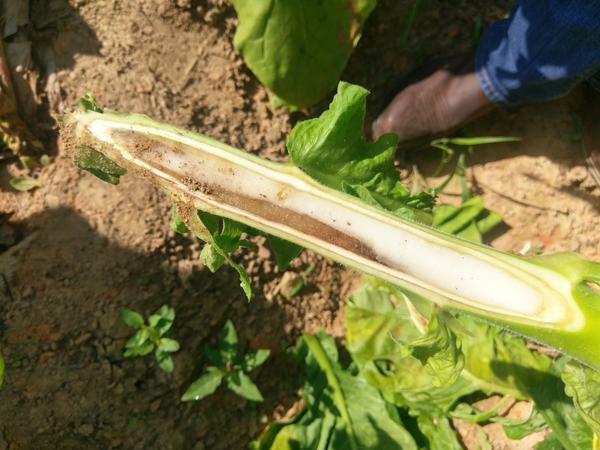 The American Phytopathological Society provides a complete review about black shank disease in tobacco. 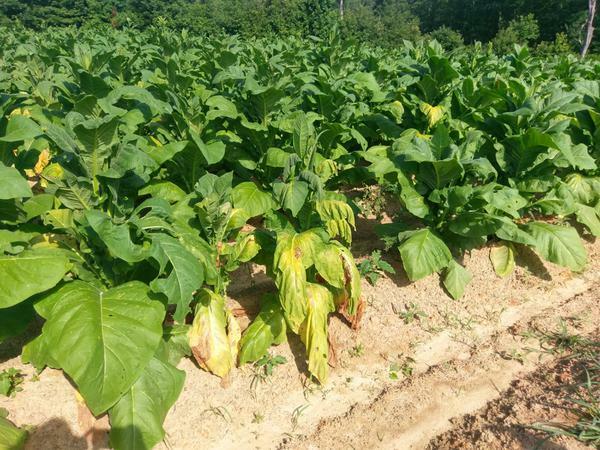 The Tobacco Diseases Information page, created by the Shew lab at NC State University, provides in depth information on this and other tobacco diseases found in North Carolina. For assistance with a specific problem, contact your local N.C. Cooperative Extension agent. Recommendations of specific chemicals are based upon information on the manufacturer's label and performance in a limited number of trials. Because environmental conditions and methods of application by growers may vary widely, performance of the chemical will not always conform to the safety and pest control standards indicated by experimental data. All recommendations for pesticide use were legal at the time of publication, but the status of registration and use patterns are subject to change by actions of state and federal regulatory agencies.